1. Click export menu to open the export window. 2. 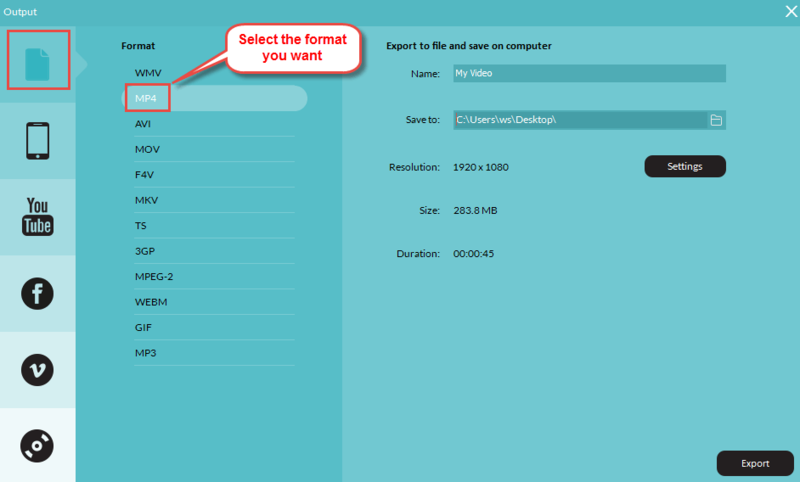 Click format menu and choose a format such as mp4. 3. Click settings to do some customization if you want. 4. Click export menu to start to export. 1. Click output to go to the output window. 2. Click format and then click settings. 3. 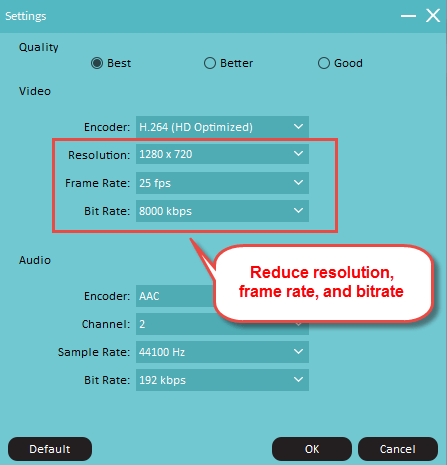 Reduce the values of resolution, bit rate, frame etc. 4. Then the exported video will be with a smaller size. Why it says there is not enough space when you burn a DVD? As you know, a standard DVD has 4.7G space,so if your project is bigger than 4.7G, it will prompt you this warning. 1. 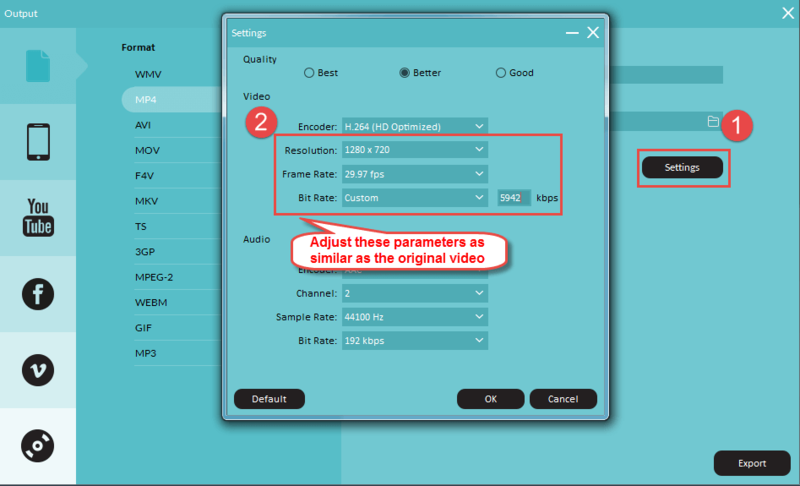 Change the video quality option to low quality so that the software can help you compress your video to a smaller size. 2. Try to insert a new dual layer DVD which has 8.5 G space. 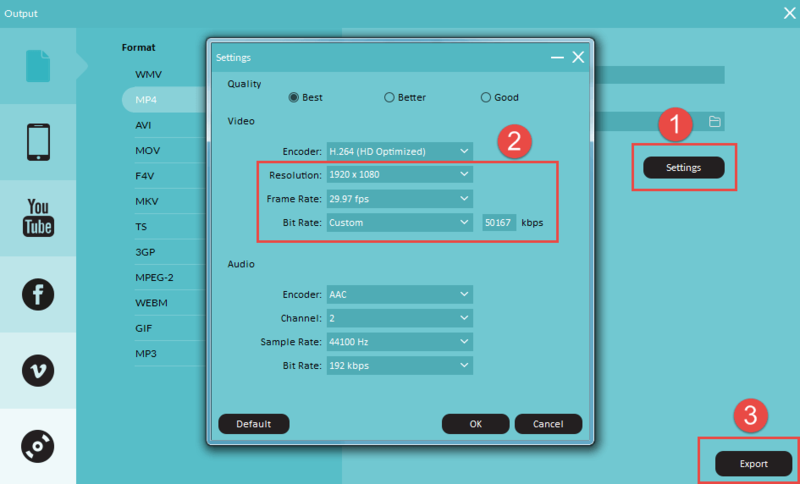 What can I do if the output video and audio is out of sync? If the video and audio is out of sync after exporting, please follow these steps to have a check. 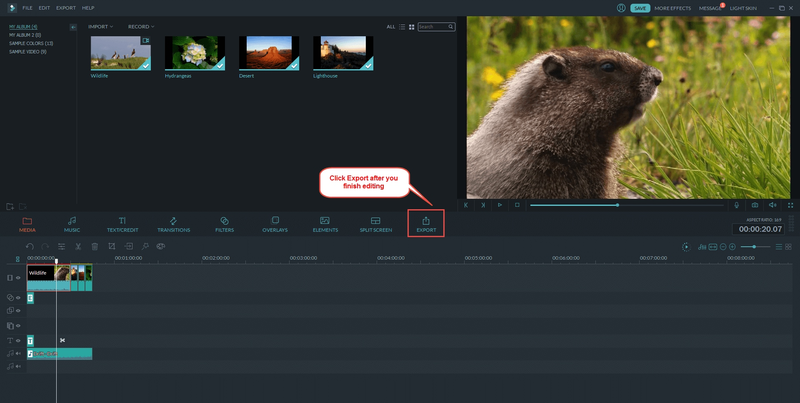 1.Reload the project (.wve) file to Filmora，check if all the elements on timeline have been aligned precisely. 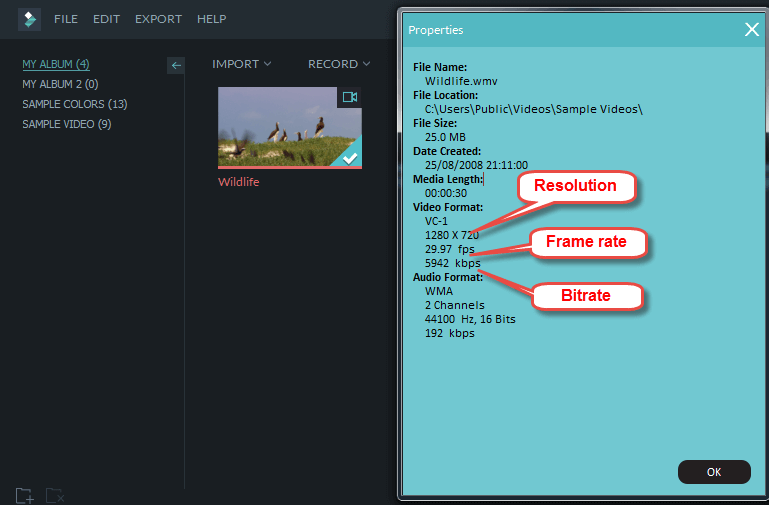 2.Go to Media library, select the original video of the project, right click and select Properties,it will show you the basic info, such as resolution, frame rate and bit rate. 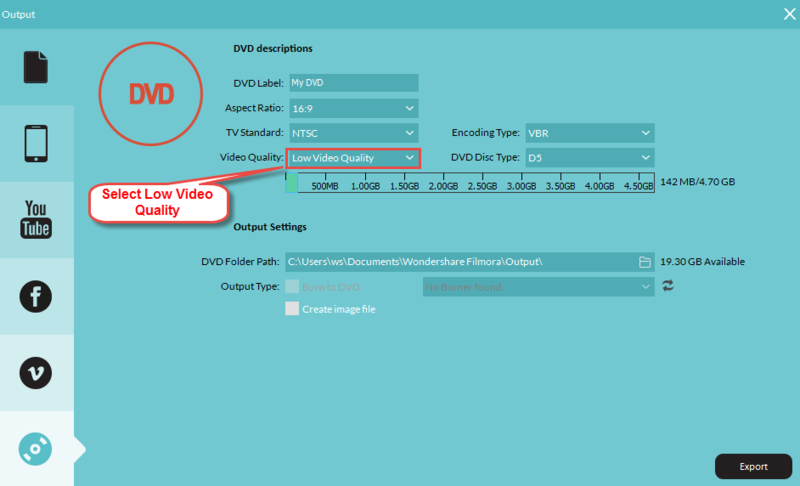 3.Go to the output video, select settings and refer to the properties info to adjust the output parameters as the same or similar as the orginal video.If you can not find the value in the dropdown list, you can also input the customized value manually. If it did not help, please go to our Support Center and submit a ticket for further assistance. If the timeline duration is not the same as the exported video, then there might be some small fragments left on timeline. You need to locate the fragments and then manually remove them. You could follow below steps to locate and remove them. 1. Press Zoom to Fit Timline button to enlarge the timeline to the maximum.Right click the fragments and choose Delete. 2. After delete the fragment, you will find the duration time has changed in the preview window. Meanwhile you could replay the project file again and see if there is extra blank frame. Why I fail to upload the video to Facebook through Filmora? Recently, the Facebook announced a new rule to forbidden any third party software to upload video to Facebook. So the function to upload video to FB through Filmora stop working and we have removed this option in the new version also. As a workaround, you may export and save the video to your computer first then upload it to Facebook through web browser.